We’re excited to announce the release of our new skin with improved user-interface and user-experience. Using the feedback we’ve gathered from current users, we have developed the new skin to fit your needs. This skin is available for all users: new users will use the new skin right when they sign up while current users are able to switch to the new skin under personal settings. For current users, easily switch back to the old blue skin if you are not used to the new skin. This skin retains the core of Ganttic’s features and layout. Resource lists are situated on the left of the planner, taskbars within the planner and the calendar above the planner. Planner customization and management features are located above the calendar. 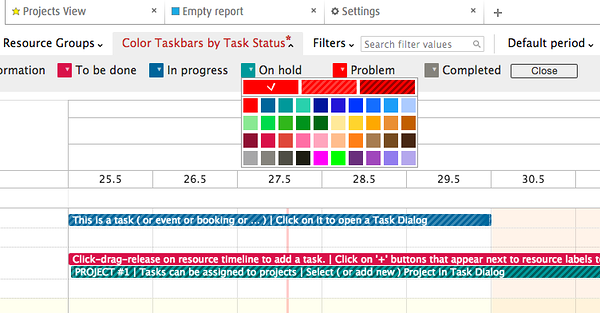 To create a task, simply click-drag-release along the Gantt chart area. The list of similarities goes on, so users can be reassured that important functions are still available. Being easier on the eyes, this skin has adopted a clearer and cleaner interface to accentuate task bars’ colors, which are the core of the planner. The improved skin includes tabs for easy navigation and management of your settings, users, and planner. Resource grouping, taskbar coloring and filtering are situated along the same bar for effortless and nuance customization. Tasks, projects and resources are the core of Ganttic. Note the implementation of the import buttons and descriptions for each option. Resources are listed and grouped on the left of the planner. Instantly hide a group of resources to save on screen space and create tasks for the shown resources. Utilization is shown in both numbers and a visual utilization bar, useful for instant visual comparison. The ‘Save view’ button along the customization bar provides you with the option to save your customization for later uses. Add a tab for a specific view of your settings, users, planner and more. The tabbing function is works like this: To add a new tab, a selection of resource views and reports will appear. Delete a view if it’s not useful anymore. We now have a new way of visualising your taskbars better. There are up to 120 variety of colors, shades and patterns to choose from. In addition, set a particular color for your holiday to differentiate bank holidays, personal holidays and more. This function can be found under each task’s dialog. Ultimately, this new skin addresses visual changes to path way for future feature development plans. To learn more about how current users can change their current skin to the new skin, here’s a comprehensive how-to article on it. If you don’t have an account, sign up here to access this skin’s features and updates. Have you used the new skin? Share with us your thoughts!